After playing down the middle for the first two games of the tournament, Saarela was moved to the right wing where he spent the majority of his season with Lukko’s Liiga team. He didn’t have a particularly good game, as his giveaway led to the opening goal for the Czechs and his dumb goalie interference penalty ruined Finland’s comeback plans in the last minutes of the game. Saarela is an above-average skater and uses a very upward stance for most the time. His first few steps are not the most explosive and he doesn’t have blazing speed, but I don’t think that the skating holding him back. Saarela is usually regarded as a smart player and plays on both special teams, but I have started to question how good his offensive instincts are. His hands are also above-average, as he is able to pull off good dekes from the time to time but also lost the puck a couple of times in critical situations. I’m not sure if he was frustrated, but he played more physically than I’ve seen him play before and actually made a few nice hits. Antti Saarela played on the top line with Kasperi Simontaival and Patrik Puistola when Finland faced USA before the 2019 World U18 Championships. Saarela has some experience from men’s games in Liiga as a winger. There’s uncertainty that he’s able to translate his game to higher levels as a center. If he’s pursuing that, the Finn’s first few strides are in need of more explosiveness. Saarela seemed a bit sluggish without the puck, which was being highlighted when Finland carried the puck through neutral zone. Saarela has to improve his edge work. He seemed static in the defensive zone because he wasn’t carrying much speed. However, he was well-positioned and had a very good gap control while being in a defensive position. 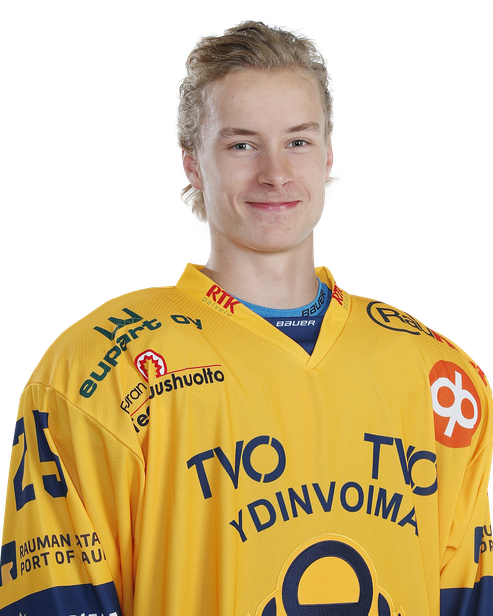 Saarela played on the power play, and his strong fore-checking abilities allows him to be effective also on the penalty kill. With the puck Saarela picked up the pace of his game and did a couple of nice stickhandling moves when attacking the defender. Saarela played as a center but the elements of playing like a winger were very noticeable. When Finland had the puck, Saarela floated around the neutral zone looking to receive a pass. Furthermore, his positioning in the offensive zone seemed off sometimes. Saarela was a bit more involved to the play as the game progressed. His overall game pace needs be faster, though. Saarela played his 10th game in men’s league against HPK, skating his season topping ice time (15:16) and scoring his first Liiga goal. Registered three shots on goal. His ice time was likely increased because of Linus Nyman missing from the lineup because of the U20 WJC Camp. Played wing on veteran C Tapio Laakso’s line with Ville Petman on the other side. Saarela’s overall appearance was not overly impressive in every shift, but ended well thanks to a couple of great shifts in the third period, when his line was able to create long shifts in the opposition’s end. Scored his goal by getting the puck on the circle, taking a few kicks into the middle and then hitting a “half slap shot” that beat HPK goalie Emil Larmi. The goal meant he now has one goal and four assists in ten Liiga games. Saarela seemed a bit static sometimes, but did handle his defensive responsibilities nicely and seemed well positioned all time. His skating looks good. Got involved when it was necessary, pushing the puck out of the own zone and from opponent’s stick. Judged by these few games I’ve seen, his wrist shot could be better. Can use his stick in defensive plays but doesn’t look like much of a playmaker in offensive situations. Overall, doesn’t really look like a top sniper or a offensive stud, but being smart and skating well at this age he definetely has some tools to build on. Saarela player 9:34 against HPK, which was his third game in the men’s league. He registered one shot on goal and sat through one two-minute penalty. Saarela played on the fourth line. Majority of the game was spent on the Lukko’s end, so Saarela didn’t get to create a lot of offense. His appearance was still pretty impressive, as he appeared to pay a lot of attention to the game around him, keeping his head up and keeping his position ready and close to engage when Lukko got the puck. Paid a lot of attention to his stick when defending Lukko’s own zone. Saarela once got to flash his impressive top speed and skill in the first period when he skated past the HPK defender and managed to shoot the puck. It would be interesting to see Saarela in a game where Lukko would have the puck control all game. Didn’t get involved in the physical game much, though he didn’t seem to avoid it either. Saarela was Finland’s first line center in this game. He made two goals against Switzerland, but I felt that he his performance left some more to be desired. Being the first line center, I would have expected him to be better playmaker. He was outside the play too much and many of his key passes did not connect properly. Also I thought he did not use his line mates properly trying to make things happen all by himself. These parts of the game makes me somewhat concerned about his hockey IQ. He did pretty good job at the defensive zone however showing some grit, but he lost surprisingly many board battles. That being said, Saarela has couple of interesting qualities. He is really good and strong skater. When he gets the puck when he already has his feet moving, he is a dangerous asset for his team and this was showcased with his shorthanded goal when the Swiss defenders had no chance to stop him in breakaway. Also his stickhandling is above average as he showed good poise and quick hands couple times during the game. With these assets I think that he could become better winger than center when it’s all said and done. Saarela played for almost 16 minutes in 2-1 loss against Tappara. He didn’t record a single shot in this game and he lost majority of his face-offs. Saarela is a fine skater with pretty good acceleration and above average top speed. However he has grown during the recent years and this why he still has frame to fill up. He is lightweight but he shows surprisingly lot of grit nevertheless. He is willing to go to the physical battle and he gave couple of heavy hits and knocked others off the puck couple of times. Saarela is pretty good at stickhandling but he carried the puck bit too much and instead of giving easy pass, he often tried to dangle his way through couple of opponents and these attempts weren’t successful. While Saarela helped defense when it was necessary and his positioning was solid, he could play a lot more active checking game. He also seemed somewhat lazy to come back to defense when his team lost the puck in the offensive zone. However when he got the puck at the own end, he was calm and was able to give crisp and precise passes which allowed his team to advance from the own area. You can see his young age from his decision-making but I think his hockey sense is solid for a player of his age. Saarela had a three-point game with one goal and two assists. His very quick and smooth skating stood out even more now that he played against players of his own age. His skating is easily above-average at this point in time. He has really good poise and quick hands, allowing to carry the tempo of the game. Showed strong decision making in possession. Has a quick slap shot with some serious power on it. Good work ethic and reliable defensive game.